You are here: Home / Events / Summer Reading Programs Begin! Come to the library and sign up for a lot of summer reading fun. Did you know that the Winters Friends of the Library uses some of our funds to sponsor special programs at our Winters Community Library to enhance the summer reading programs offered by the library system? 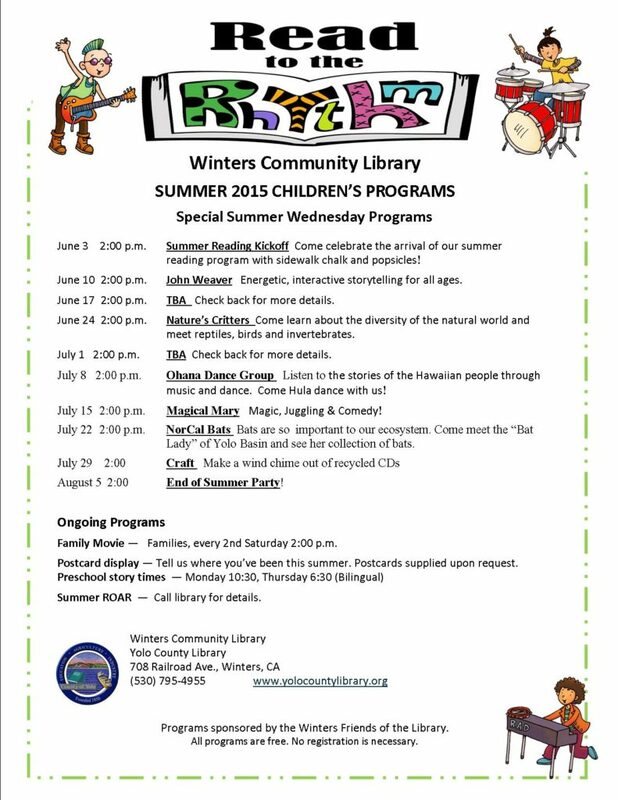 Well, we do and here is a list of what is happening this summer at the library. So mark your calendars and come on down to sign up to get into the rhythm of summer reading. The program kicks-off Wednesday, June 3. Come celebrate the arrival of our summer reading program with sidewalk chalk and popsicles! Energetic, interactive storytelling for all ages. June 17 – TBA Check back for more details. Come learn about the diversity of the natural world and meet reptiles, birds and invertebrates. July 1 – TBA Check back for more details. Listen to the stories of the Hawaiian people through music and dance. Come Hula dance with us! July 15 – Magical Mary Magic, Juggling & Comedy! Bats are so important to our ecosystem. Come meet the “Bat Lady” of Yolo Basin and see her collection of bats. August 5 – 2:00 End of Summer Party! Don’t miss out! See the flyer for additional ongoing program offerings.